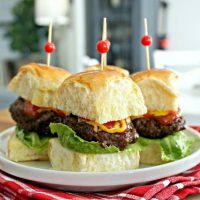 These Air Fryer Mini Burgers with Cheese are ready in less than 10 minutes, are full of flavor and oh so juicy! Plus, they can be made using ground beef, ground turkey, ground chicken or ground pork, and the kiddos love them! Here in Kentucky, it has been raining for months, which means our grill has been out of commission for the most part. I’ve also recently become obsessed with cooking anything I possibly can in our air fryer. 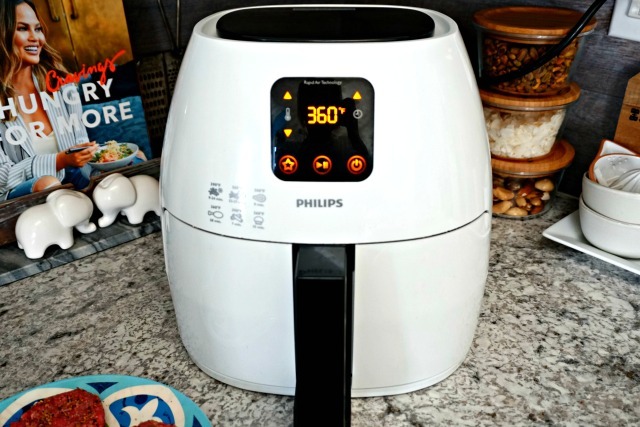 I recently shared How to Cook a Whole Chicken in an Air Fryer, and will be sharing many more easy recipes and shortcuts using my new favorite appliance! Last week, I was planning on making mini burgers for our family, and of course, the weather didn’t cooperate. So, I decided to give the mini burgers a try in the air fryer. I’ve already been cooking “grilled” chicken breasts and pork chops in the air fryer, and they come out nicely charred on the outside and moist and juicy on the inside, so I crossed my fingers hoping the burgers would do the same. Y’all, I couldn’t be more pleased! In less than 10 minutes, I cooked the most perfect mini slider cheeseburgers, and have made them two more times since! I even made a buffalo turkey burger version that was to die for! Don’t worry…I’ll be sharing all of those recipes within the next couple of weeks, so stay tuned! This post contains affiliate links, which means if you make a purchase using on of the links I provide, I will receive a small commission. Step 1 – Choose your type of burger. You can use ground beef, ground chicken, ground turkey or ground pork. 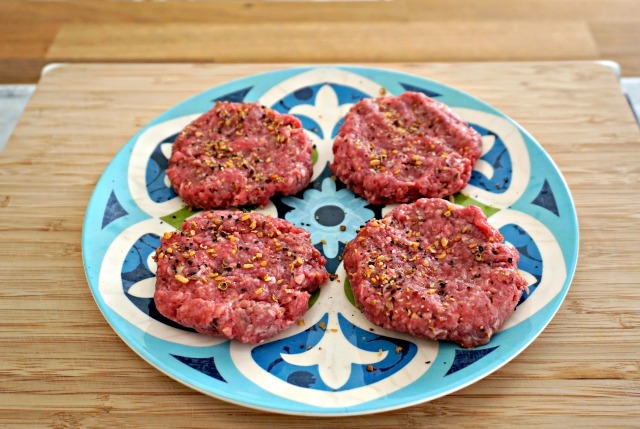 Step 2 – Shape your burgers into patties. For 4 mini burgers, I used about 3/4 of a pound of ground beef. Step 3 – Season your patties with salt and pepper or your favorite steak seasoning. Step 3 – Preheat your air fryer to 350˚ or 360˚. Most air fryer models will have the 350˚option, but the XL Philips Air Fryer I use has a 360˚ setting instead. 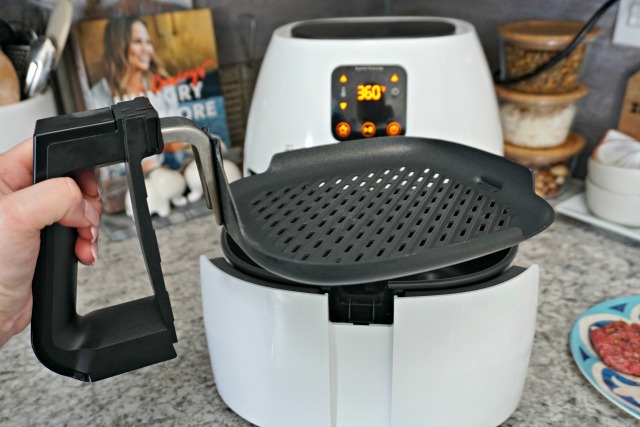 If you are in the market for an air fryer, but would like a less expensive option, I also love the Gourmia air fryers like this one. I have one that I purchased at Costco that I use for smaller meals. Step 4 – Place your burger patties in the air fryer basket or on an air fryer grill plate if you have one. Step 5 – Preheat your air fryer to 350° – 360°. Step 6 – Cook for 5 minutes, then flip and cook for an additional 4 minutes. Step 7 – Add cheese to the top of each burger and close for 1 minute, then remove the burgers from the air fryer and serve them on mini buns or Hawaiian Rolls. ***NOTE*** The grill plate is not needed. I purchased one (seen below) because I use it almost every day. This particular grill pan is made to fit the Philip’s XL Air Fryer, and you can purchase it HERE. If you have a different air fryer model, you can just use your air fryer’s basket or search amazon to see if they have a grill pan available for your particular model. 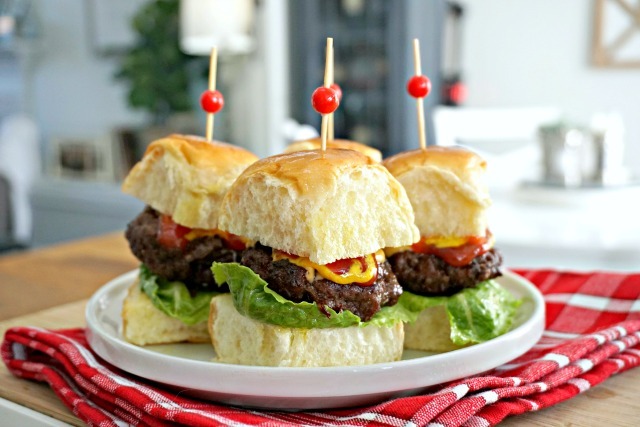 We love serving our mini burgers on Hawaiian rolls with air fryer french fries. You can even take it a bit further and make a fun mini burger bar with all the fixings like pickles, tomatoes, onions, lettuce, mayo, mustard and ketchup! They also make the perfect party food for a crowd! 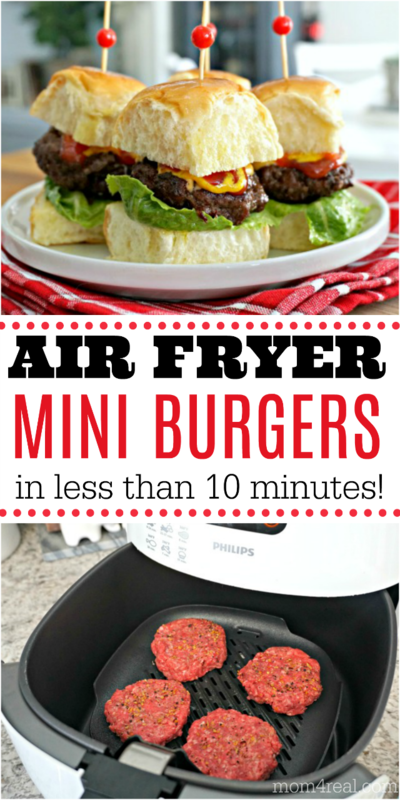 These Air Fryer Mini Burgers with Cheese are ready in less than 10 minutes, are full of flavor and oh so juicy! Plus, they can be made using ground beef, ground turkey or ground pork, and the kiddos love them! Why do you like the grilling pan option? Just curious. Do you think it makes a difference on burgers and chops? 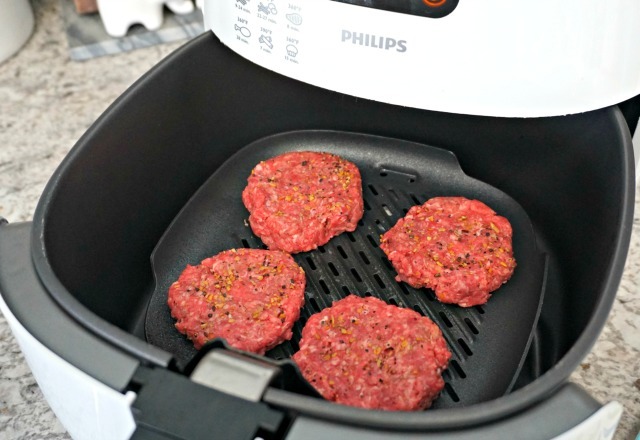 I also love my air fryer and plan to try your burgers this weekend. Here in Missouri, it has been too cold to grill outside. Love you site. God Bless. Hi, Kim! I just like the grill pan mostly because it’s non-stick and leaves grill marks. There really isn’t a need for it, it’s just my preference. I added it to my order when I originally purchased my air fryer, so I had it from the beginning. Have a beautiful day! I love your hot pot recipes and now the air fryer.